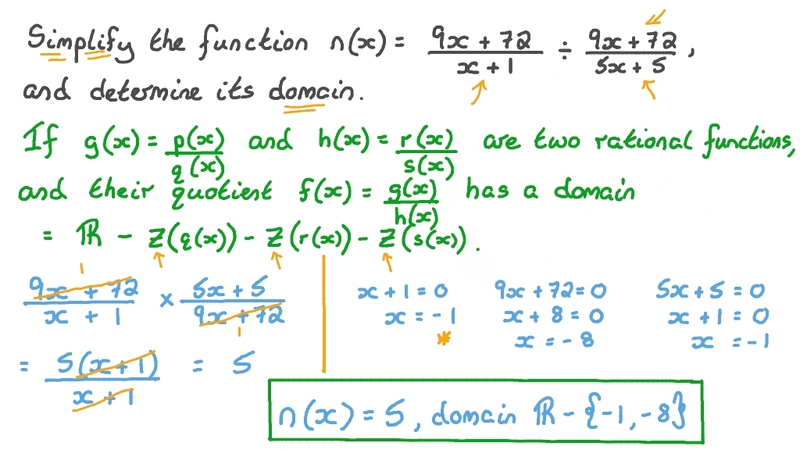 In this lesson, we will learn how to factor quadratic expressions and work with algebraic fractions containing linear, quadratic, or cubic expressions. Which of the following functions are equal? Simplify the function 𝑛 ( 𝑥 ) = 𝑥 + 7 𝑥 6 𝑥 + 2 5 𝑥 + 4 ÷ 6 𝑥 − 𝑥 3 6 𝑥 − 1 2 2 2 2 . 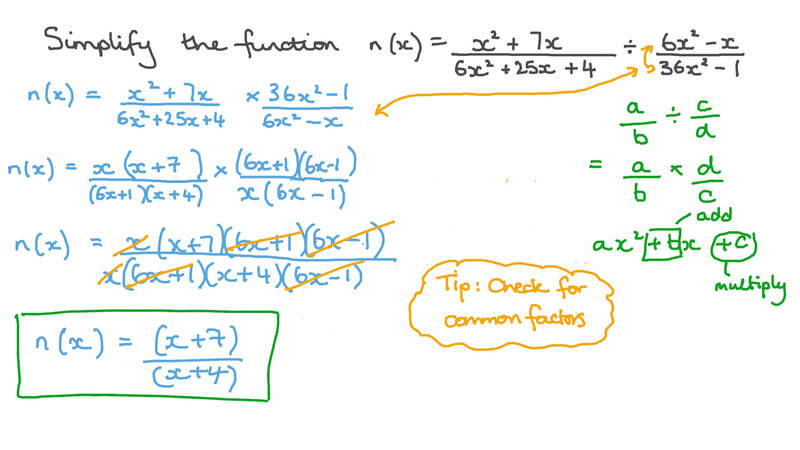 Simplify the function 𝑛 ( 𝑥 ) = 9 𝑥 + 7 2 𝑥 + 1 ÷ 9 𝑥 + 7 2 5 𝑥 + 5 . Simplify the function 𝑛 ( 𝑥 ) = 𝑥 + 4 𝑥 − 1 2 𝑥 − 3 6 ÷ 5 𝑥 − 1 0 𝑥 − 1 2 𝑥 + 3 6 2 2 2 . Given that 8 𝑦 𝑦 + 2 𝑦 − 9 𝑦 𝑦 + 2 𝑦 = − 2 2 3 2 2 , find the value of 𝑦 .
Simplify the function 𝑛 ( 𝑥 ) = 5 𝑥 + 1 5 𝑥 + 5 ÷ 6 𝑥 + 1 8 4 𝑥 + 2 0 . Simplify the function 𝑛 ( 𝑥 ) = 𝑥 − 1 3 𝑥 + 4 0 𝑥 − 6 4 ÷ 9 𝑥 − 4 5 𝑥 + 1 6 𝑥 + 6 4 2 2 2 .